The Prize, initiated in 2008, recognizes the best master of science thesis or paper during the academic year among those nominated by the world’s leading academic programs in geographic information science and systems. The USC Spatial Sciences Institute as the UNIGIS USA site nominated Steves’s thesis, which was reviewed by an independent review board. 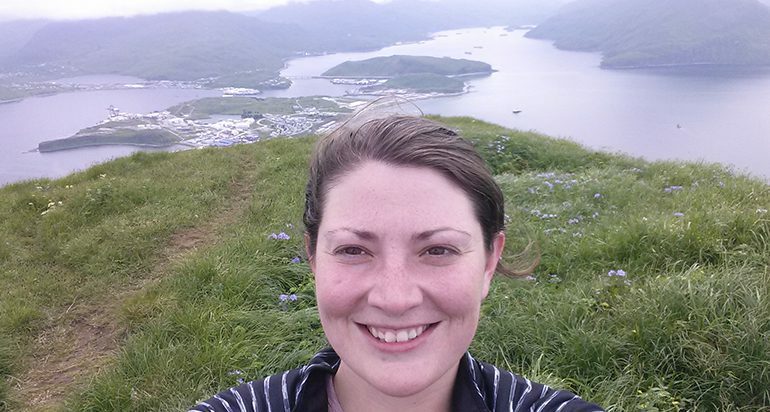 In her thesis, Steves investigated the spatial and temporal extent of Alaskan bottom-trawl fishing effort on the health of the ecosystem in the Bering Sea, Aleutian Islands, and Gulf of Alaska. She examined National Marine Fisheries Service data collected between 1993 and 2015 in a space-time cube using ArcGIS Pro. The variables analyzed were number of hauls per area and total catch per area. She used statistical techniques to examine spatiotemporal autocorrelation and clustering in these data, and found that fishing effort was non-randomly clustered over space and time. A three-dimensional hot spot analysis showed which areas were most intensely fished and illustrates the long-term trends over the study period. She then compared the data with two external factors, sea ice concentration and closed marine protected areas, to determine the effect of changing regulations and climate on fishing activity. She found that the implementation of new Marine Protected Areas in previously fished areas caused a shift in fishing effort to the still open adjacent areas. Sea ice had a limited effect on fishing effort spatial patterns, but certain areas in the Bering Sea exhibited increased fishing effort in years with less sea ice effect. Her thesis advisor was Dr. Karen Kemp. Dr. Steven D. Fleming and Dr. Travis Longcore served as committee members. For the prize, Steves received a certificate and 500 euros. She and the other winners also are receiving a free ticket to the annual GI Forum organized by the University of Salzburg to present their research, which will be held July 2 – 5, 2019 in Salzburg, Austria. For more information about the USC Spatial Sciences Institute M.S. in Geographic Information Science and Technology Program and other GIS graduate programs, visit gis.usc.edu.